Myrhorod Mayor, Serhiy Solomakha, signed a project implementation agreement with PLEDDG Project which would see the introduction of a low power FM-radio service. This low power FM-radio service will serve as a media instrument for increasing the openness of local government and meeting information needs of Myrhorod’s residents. On April 19, 2018, Myrhorod Mayor took part in the meeting of PLEDDG Project Steering Committee in Kyiv. Among the special guests were Roman Waschuk, Canadian Ambassador to Ukraine, Karim Morcos, Head of Development Cooperation of the Canadian Embassy, Garth Frizzel, Councilor of the City of Prince George and a Board Member of the Federation of Canadian Municipalities, Oleksandr Slobozhan, Executive Director of the Association of Ukrainian Cities, as well as representatives of Ukrainian ministries, oblast state administrations and PLEDDG Project partner cities. At the meeting, a PLEDDG Project progress report for year 3 was presented and plans for the next year were discussed. In particular, for Myrhorod the cooperation with PLEDDG Project will continue in the sphere of communications. A FM-radio station will be created on the basis of a local TV station “Myrhorod”. According to Serhiy Solomakha, following the analysis of the current catastrophic situation with wired radio, it was concluded that the only way to remedy the situation was to shift to FM radio broadcasting in line with the methodology and recommendations developed by the National Council of Ukraine on Television and Radio Broadcasting. FM-radio broadcasting is projected to cover the entire territory of Myrhorod as well as neighboring villages, which, in the future, will be integrated into the Myrhorod sub-region. 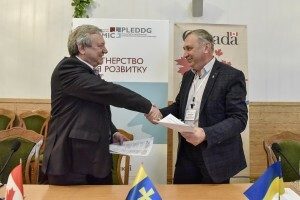 PLEDDG project will allocate 400,000 dollars from its Democratic Governance and Development Initiatives Support Fund for the Myrhorod FM-radio project.